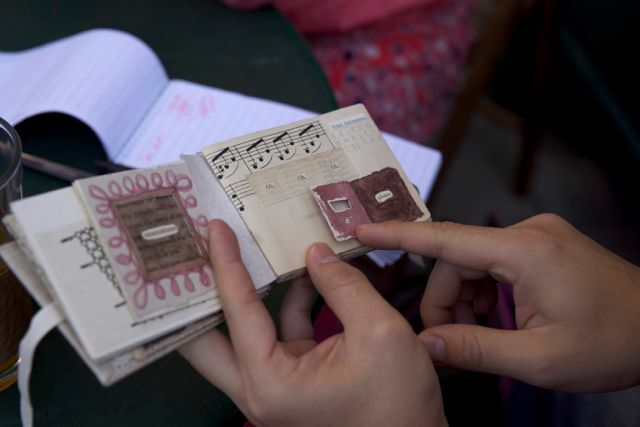 Rachel Hazell is a traveling bookbinder who believes “everybody has a story inside of them and she wants to travel the world to get it out.” The self-proclaimed bibliophile believes this so much, that she’s trottin’ across the globe to inspire people to dig deeper within to share their stories through the art of binding hand made books. She hopes that you too, will be inspired to pause and earmark a page out of your busy life to share your story and find your passion – whatever it may be. When I heard that Rachel’s latest stop was in San Francisco, I knew I had to meet her. 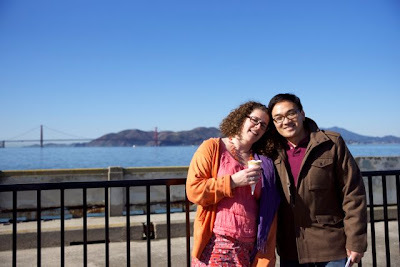 We met at one of my favorite haunts, Café Sapore, in the charming neighborhood of North Beach (San Francisco’s version of Little Italy) to talk about her passion. The sun broke through the chilly breeze as we sat outside this cozy café and sipped some beverages (I had jasmine almond tea and she enjoyed hot chocolate) and shared a coconut cookie. 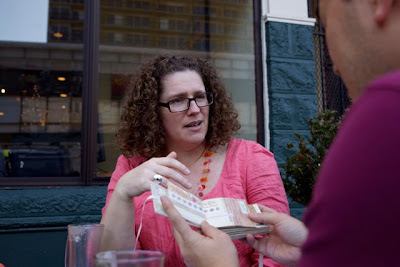 She shared her personal story about what led her to the revelation of her passion of bookbinding and why she’s dedicating her life to helping people tell their stories through her unique craft. 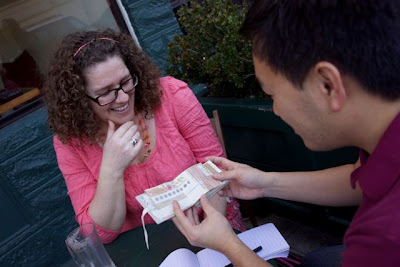 “My love for bookbinding was innate and came out of loss,” Rachel says in an energetic British accent. When she was eight, she remembers the neighbors in her countryside of Somerset would sell apples along the roadside. She was so fascinated with books and how they were put together, she taught herself how to make books and wanted to sell them on the side of the road, but wasn't allowed. “The little books were awful,” she admitted with a quirky laugh. But it brought her joy – a joy she wants to share with everyone she meets. “When I make books and I’m teaching people, time stops. I am fully in the moment and don’t worry about anything else.” She says smiling. By her early twenties, she endured two tragedies. Both parents passed away. She had an epiphany – life is too short not to love what you do. ‘Read make love books’ became her mantra. She went off to Edinburgh to study and live; and it was when she went on a bookbinding workshop that the eureka moment hit! 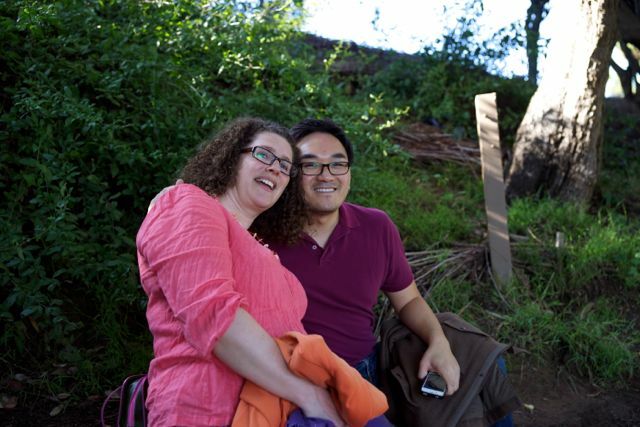 ‘I want to do this for the rest of my life’, she thought and sure enough she did! the inspiration was passed on. 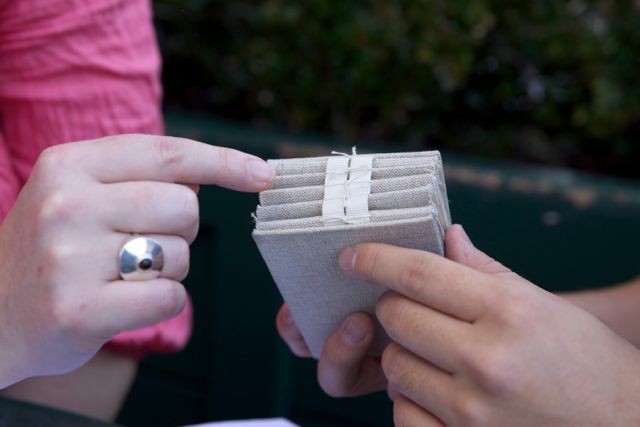 “I started teaching four friends how to bind books around my kitchen table. They shared with their friends and then people started to ask me to travel to their hometown to teach workshops,” Rachel said genuinely. I could sense Rachel’s zest for adventure, so I took her on a walking tour of the neighborhood for the next part of my chat with Rachel. 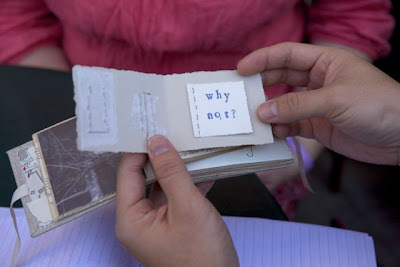 I learned that, like binding, the pages in books her joy comes from bringing people together. I started to see that the process allows people to delve deeper inside themselves to discover their own passion in the stories of their lives. What she loves most is the sense of community and discovery -- a sort of cathartic coming together – and the sharing of stories and materials during a bookbinding session. Her carefully thought out, hand made, detailed storybooks are as personal as the stories they imbue. 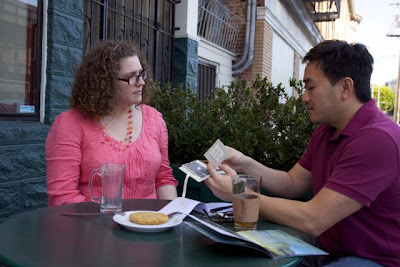 For the past few years Rachel has dedicated her time traveling to all corners of the world to teach others her unique craft. 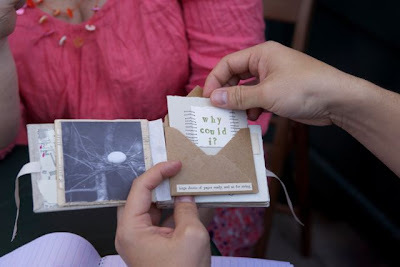 She brings small groups and communities together in workshops and teaches them how to extract their personal stories, telling them through a myriad of textures -- old torn out book pages, thread and every material and scrap of paper imaginable. 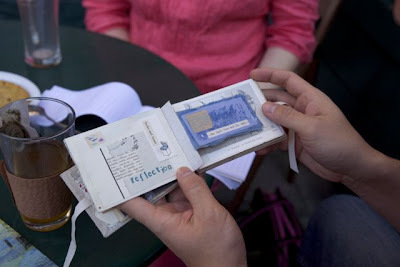 Her latest project is “The Diary of a Travelling Bookbinder.” Starting in Hebden Bridge, UK and ending in Paris, you can catch Rachel in different parts of the world every month this year, teaching different types of bookbinding workshops, if you want to join Rachel on her journey check out Rachel's website. 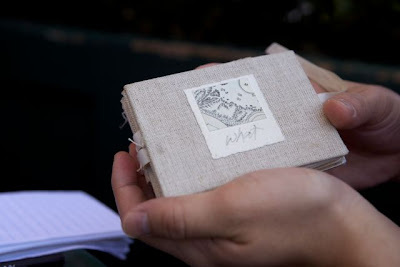 The Diary of The Travelling Bookbinder from Rachel Hazell on Vimeo. 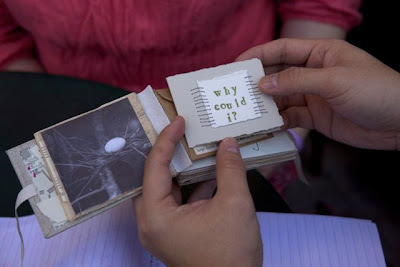 If Rachel can create opportunities for herself as a BOOKBINDER and inspire people to discover their stories (and also motivate people to help her set up workshops and make a living out of something as esoteric as the craft of bookbinding) anyone can take that risk, baby steps, towards their passion. 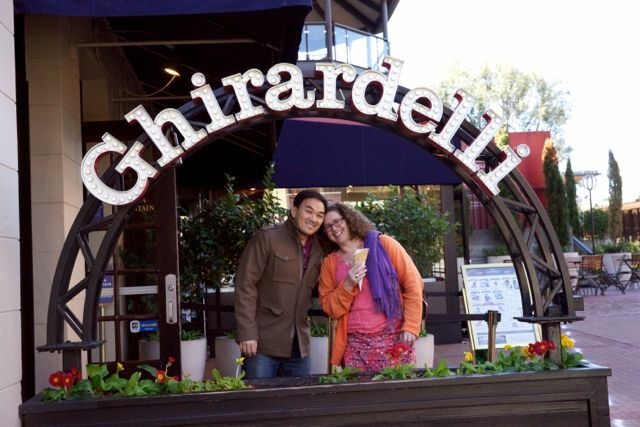 Here are some of Rachel’s tips on taking the steps to finding your passion. 1. One step at a time. Everything big starts off with a single idea and small actions. 2. Get creative with the resources you have around you like researching online and the local library. 3. Network – don’t be afraid to ask. If you don’t ask, people don’t know how to help. 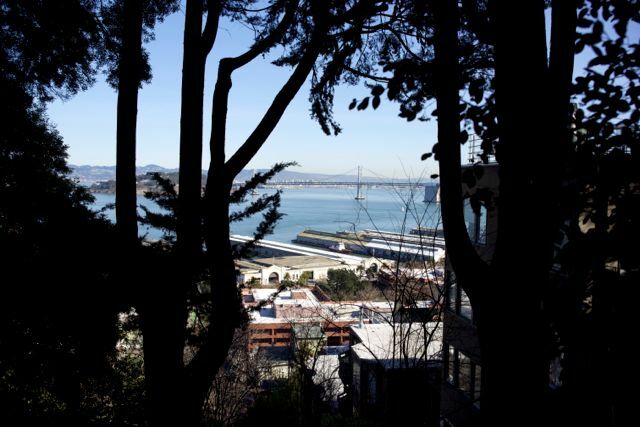 We took a moment -- and took several deep breaths -- to take in the calm of the trees that surrounded us and the view of the Bay Bridge and the view of the water. This moment seemed to quiet the hum of the city hustle bustle. We exchanged our favorite meditation techniques. 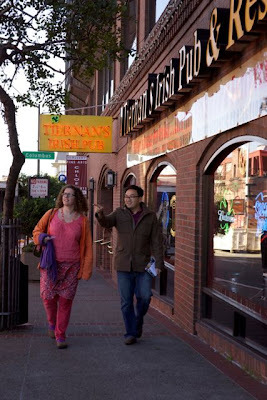 (Rachel practices the Five Tibetans. I simply like to focus on my breath going in and out of my body while focusing on different parts of my body, mentally feeling and scanning head to toe.) Rachel revealed that she doesn’t think she’s a spiritual person and that, figuratively, “her book isn’t out yet.” My hunch is that with each stop, each lesson and each person she meets, the chapters of her life’s passion are being bound by joy. What’s your passion? Are you living it? If not, why not? Please share your story in the comment section below. So exciting to see the lovely Rachel Hazell featured here! Her passions for all things bookish are inspiring. Kat, thanks for your comment and for sharing. Yes, love Rachel's energy and quirky creativity!